Highway Kings Video Slot Guide & Review - Casino Answers! Highway Kings is a 5-reel, 9-line video slot developed by Playtech, featuring a wild symbol, scatter wins and a progressive jackpot. You can play the Highway Kings video slot at Bovada. Bets on the Highway Kings slot machine are $0.01, $0.05, $0.10, $0.25, $0.50, $1, $2 and $5 per line. You can select from 1-9 paylines on the Highway Kings slot game. You can bet anywhere from a penny per spin on the Highway Kings penny slot up to the maximum total bet of $45 per spin. To play the Highway Kings video slot, select your bet and hit the “Spin” button. To play all 9 lines, press the “Bet Max” button. The highest paying symbol on the Highway Kings online slot game is the Red Truck symbol. If you hit 5 Red Truck symbols on a selected payline, you will win the 10,000 coin top jackpot. The Red Truck symbol is wild and will substitute for all symbols except for the Scattered Muffler. Other high paying symbols on the Highway Kings slot game are the Yellow Truck (5000 coins), Green Truck (1000 coins) and Gas Tank (1000 coins) symbols. You can win these jackpots on Highway Kings by playing at Bovada! Enable the Dollar Ball mode to play for the Highway Kings progressive jackpot. The Dollar Ball lottery costs $1. You get 5 numbers out of 49 to choose from. If all five numbers match, you will win the Highway Kings Dollar Ball progressive jackpot lottery. You will also receive prizes if you match as few as one number. The Dollar Ball feature cannot be activated in free play. 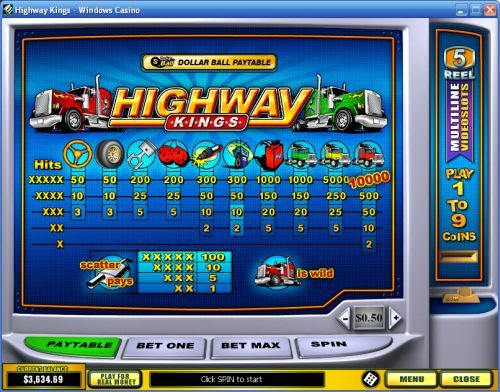 Highway Kings’ autoplay mode is located under “Menu.” You have the option of simply entering the number of spins or you can use the arrows on the left side to expand the autoplay feature into the Advanced Mode. You can set the stop settings of: Jackpot win, single win more than (up to $99,999), overall Win more than (up to $999,999) and overall loss more than (up to $999,999). You can also set the delay between spins to speed up the autoplay. Autoplay can be cancelled at any time by using the “X” button. Highway Kings is a decent video slot that has a good number of very good payouts. Other than that, it doesn’t have any real special features or a good presentation. You can play the Highway Kings online slot game when you sign up and deposit at Bovada. Can players from the United States play the Highway Kings online slot for real money? Unfortunately, American plays cannot play the Highway Kings slot machine for real money at Playtech online casinos. Americans can sign up and play at USA-friendly Vegas Tech casinos such as Bovada. Where can I play a Highway Kings Flash game for free? 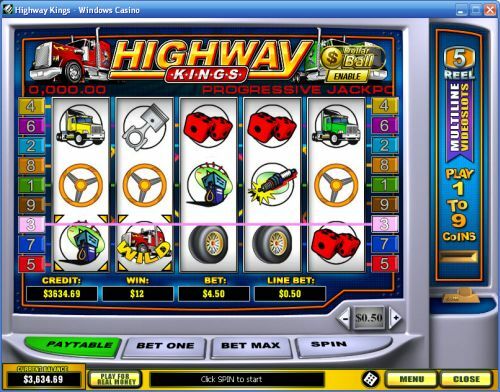 You can play the Highway Kings Flash game at Playtech Instant Play casinos such as the ones at Bovada. You can play for free or for real money. If you experience difficulties with the Instant Play casino software, make sure you have the latest version of Adobe Flash Player.